Just in time for the holiday lull, here is a fun ML project that processes a popular movie-clip down to the actor’s face and biography in a fully automated pipeline and in near real time! It’s all done in around 200 lines of code. This may seem like a lot of code, but just five years ago it would have required tens of thousands of lines and a headache. 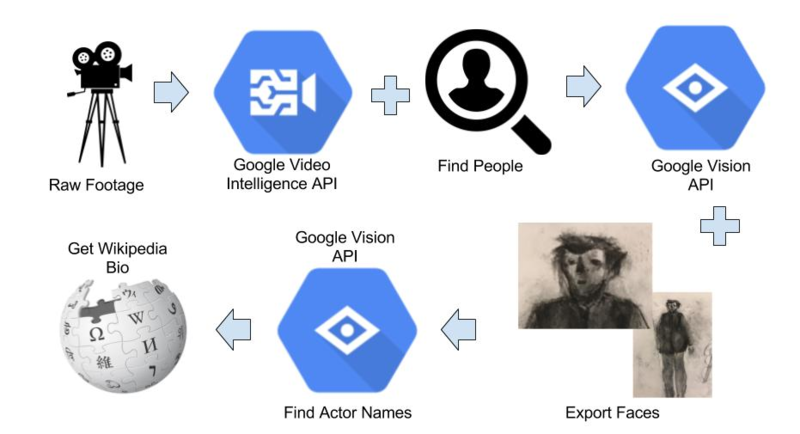 At SpringML, we’ve built many solutions using the versatile Google Cloud suite of APIs but some of the funnest projects have been working with the Google Video Intelligence and Vision APIs in particular. Leveraging these two powerful APIs is like having an army of convolutional neural-network PhDs at your beck and call. That’s it! All that in around 200 lines of code which is mind-boggling. Plenty of ways of improving on this concept, customizing the pipeline with different APIs, and extending to your own needs. See the YouTube video link if you want to see it in action. Thanks! © 2019 SPRINGML. ALL RIGHTS RESERVED. Download "Getting Started with Cloud TPUs"
Download "Salesforce Einstein Discovery Quick-Start Packaged Offerings"
Download "Perform Preventative Maintenance with IoT Core"
Download "Upgrade Your Call Center with Dialogflow"
What Happens When All The O’s and 1’s Turn into Meaningful Data?